EASTHAM – This year marks the 100th anniversary of the birth of John Fitzgerald Kennedy, born in 1917 in Brookline. 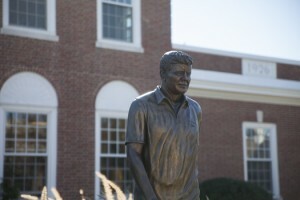 On August 1 at 7 p.m. at the Salt Pond Visitor Center in Eastham, John Allen, Executive Director of the John F. Kennedy Hyannis Museum, will present a program about the life of JFK and the Kennedy Family’s connection to Cape Cod. One of President Kennedy’s most enduring legacies is the establishment of Cape Cod National Seashore. The signing of the national seashore act on August 7, 1961 brought to fruition an idea that was conceived in the 1930s—to preserve the Great Beach and prevent large-scale development occurring at other areas along the Eastern seaboard. Following the establishment of Cape Cod National Seashore, President Kennedy would sign legislation for two more national seashores—Point Reyes in California and Padre Island in Texas, and establish several historic sites, including inventor Thomas Edison’s laboratory; Theodore Roosevelt’s birthplace and Sagamore Hill; the boyhood home of President Lincoln; and the home of activist Frederick Douglass. The program is part of the annual “Tuesday Nights at Salt Pond” series. Held weekly in July and August at 7 pm in the air-cooled comfort of the visitor center auditorium, programs focus on the diverse natural and cultural resources on the Outer Cape and are suitable for all ages. Programs are free of charge and accessible. The series is sponsored by Friends of the Cape Cod National Seashore.